The role and effectiveness of propaganda in the light of the total takeover of the media, the omnipresent atmosphere of terror, and the progressive madness of Nazi ideology. An exhilarating and definitive portrait of the anti-Nazi movement (called "Secret Germany") that almost killed Hitler, thus prolonging a further pointless year of war and the deaths of millions more. CBI - China: Day 43 of 154 of the Japanese Invasion of Manchuria. Spain: Day 106 of 985 of the Spanish Civil War. CBI - China: Day 11 of 29 of the 1st Battle of Suiyuan. Spain: Day 471 of 985 of the Spanish Civil War. CBI - China: Day 116 of 2,987 of the 2nd Sino-Japanese War. Day 79 of 106 of the 2nd Battle of Shanghai. Day 60 of 70 of the Battle of Taiyuan. USA: A radio adaptation of The War of the Worlds, presented as a series of simulated news bulletins, convinces many listeners that an actual Martian invasion is currently in progress, causing mass hysteria in some communities. It was performed in New York City as a Halloween episode of the "Mercury Theatre on the Air" series on 30 Oct 38, and was broadcast across the continent over the CBS radio network. 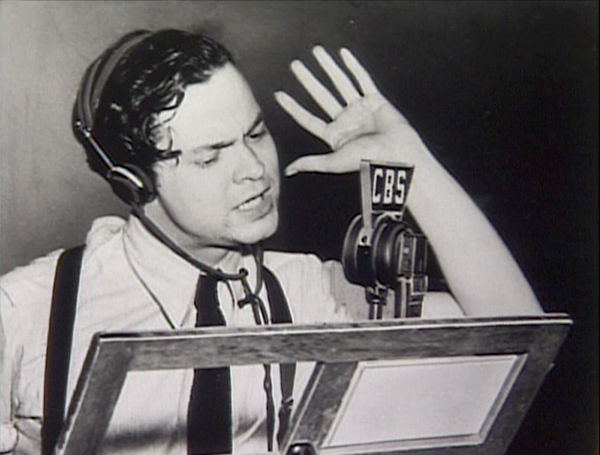 Directed and narrated by actor and future filmmaker Orson Welles, the episode was an adaptation of H G Wells' 1898 pioneering science-fiction novel "The War of the Worlds." The first two thirds of the 62-minute broadcast were presented as a series of simulated news bulletins, which suggested to some listeners that an actual alien invasion by Martians was currently in progress. Compounding the issue was the fact that the Mercury Theatre on the Air was a sustaining show (running without commercial breaks), adding to the program's realism. Announcements that the program was a dramatization of a work of fiction were made at four points during the broadcast. However, many listeners missed the announcements because they had been primarily listening to the more popular Edgar Bergen show on NBC and only tuned over to CBS during musical interludes. In the days following the broadcast, there was widespread outrage in the media, although subsequent research suggests that the hysteria was greatly exaggerated. But one thing for certain is that the episode and its fallout secured Welles' fame as a dramatist. 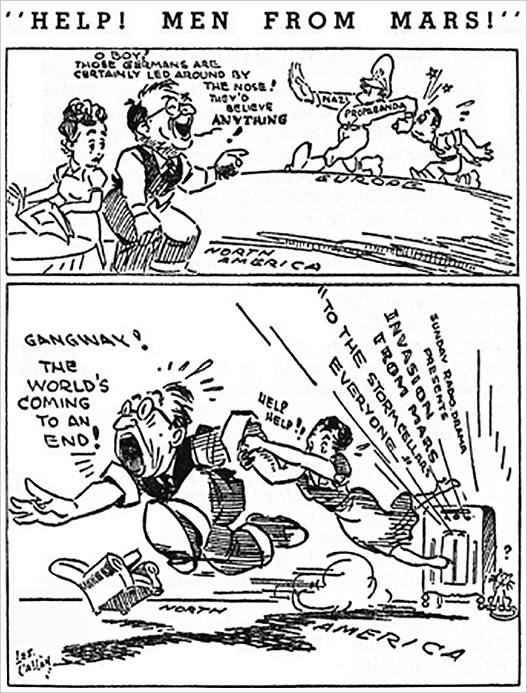 This editorial cartoon was also used in a preface to an article in Radio Digest that illuminated the nervous state that existed after the Munich Pact. A study by the Radio Research Project, a Rockefeller Foundation funded organization that looked into the effects of mass media on society, discovered that some who panicked presumed that Germans, not Martians, had invaded, saying that "The shadow of war was constantly in and on the air. People were on edge." Of the estimated 6 million people who heard the War of the Worlds broadcast, the Project reported that 25% accepted the program's reports of mass destruction. Orson Welles later said that Adolf Hitler cited the effect of the broadcast on the American public as evidence of "the corrupt condition and decadent state of affairs in democracy." Spain: Day 836 of 985 of the Spanish Civil War. CBI - China: Day 481 of 2,987 of the 2nd Sino-Japanese War. Day 19 of 81 of Japan's Operation GUANGDONG. CBI - China: Day 846 of 2,987 of the 2nd Sino-Japanese War. ETO - UK: RAF Bomber Command is given its first directive sanctioning area-bombing, aka carpet bombing. "Carpet bombing" describes large aerial bombing done in a progressive manner to inflict damage in every part of a selected area of land. The phrase evokes the image of explosions completely covering an area, in the same way that a carpet covers a floor. 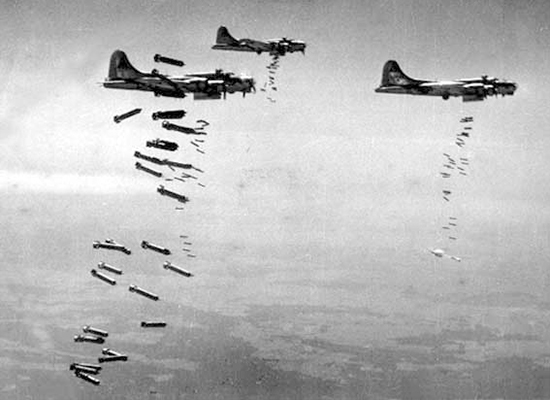 Carpet bombing was usually achieved by dropping many unguided bombs. In contrast to "precision bombing," it was not aimed at a small target, such as a bunker, an airfield or a military unit. One of its frequent uses was the aerial bombing of cities. "Saturation bombing" was a term similar in meaning, often used interchangeably. "Obliteration bombing" was also used to refer to especially intensified bombing with the intention of destroying a city or a large part of the city. The term "area bombing" also referred to the indiscriminate bombing of an area and encompassed cases of carpet bombing, including obliteration bombing. It was used in that sense especially during WWII. Many cities, both large and small, were virtually destroyed by Allied bombing during the war. Carpet bombing was often used as close air support (as "flying artillery") for ground operations. Massive bombing was concentrated in a narrow and shallow area of the front, closely coordinated with the advance of friendly troops. High-ranking officials of the Third Reich frequently described attacks made on Germany by the RAF and the USAAF during their strategic bombing campaigns as "terrorangriffe" — terror attacks. In the Pacific, carpet bombing was used extensively against Japanese civilian population centers, such as Tokyo. ETO - UK: Day 55 of 258 of the Blitz. ETO - UK: Day 113 of 114 of the Battle of Britain. East Africa: Day 143 of 537 of Italy's East African campaign in the lands south of Egypt. CBI - China: Day 1,212 of 2,987 of the 2nd Sino-Japanese War. Day 351 of 381 of the Battle of South Guangxi. CBI - Thailand: Day 30 of 221 of the Franco-Thai War (Vichy France vs Thailand). Russian Front - Finland: Day 124 of 142 of Operation SILVER FOX, a joint German-Finnish campaign to capture the Russian port of Murmansk in the Arctic. Russian Front - Finland: Day 122 of 140 of Operation ARCTIC FOX, a joint German-Finnish campaign against Soviet Northern Front defenses at Salla, Finland. Russian Front - Finland: Day 131 of 164 of the Battle of Hanko. The Soviets will be forced off their leased naval base. Russian Front: Day 131 of 167 of Germany's Operation BARBAROSSA. Russian Front - North: Day 53 of 872 of the Siege of Leningrad. Russian Front - Center: Day 29 of 98 of the Battle of Moscow. Russian Front - South: Day 1 of 248 of the Siege of Sevastopol, Crimean Peninsula. German troops reach Sevastopol on the Black Sea. MTO - Libya: Day 204 of 256 of the Siege of Tobruk. East Africa: Day 508 of 537 of Italy's East African campaign in the lands south of Egypt. CBI - China: Day 1,577 of 2,987 of the 2nd Sino-Japanese War. Russian Front - North: Day 418 of 872 of the Siege of Leningrad. Russian Front - North: Day 179 of 658 of the Siege of the Kholm Pocket, USSR lays siege to the Kholm Pocket but the Germans hold out for a about a year and a half. Russian Front - South: Day 125 of 150 of Germany's CASE BLUE, the failed offensive to take the Caucasus oil fields. Russian Front - South: Day 69 of 165 of the Battle of Stalingrad, bloodiest battle in human history. MTO - Egypt: Day 8 of 20 of the 2nd Battle of El Alamein. British 8th Army sends their Australian forces north to the sea before turning east, thus entrapping the enemy tanks in a pocket. MTO - Greece: US B-24s bomb the Maleme Airfield and Suda Bay on Crete. East Africa: Day 179 of 186 of the Battle of Madagascar. CBI - China: Day 1,942 of 2,987 of the 2nd Sino-Japanese War. PTO - Alaska: Day 146 of 435 of the Battle of Kiska, Aleutian Islands. The US and Canada will defeat the Japanese invaders. PTO - Malaya: Day 254 of 357 of the Battle of Timor Island, a long guerrilla war ending in Japanese victory. PTO - New Guinea: Day 102 of 119 of the Battle of the Kokoda Track. The Australians continue pushing back the Japanese troops. PTO - Solomon Islands: Day 85 of 187 of the Battle of Guadalcanal. Russian Front - North: Day 783 of 872 of the Siege of Leningrad. Russian Front - North: Day 544 of 658 of the Siege of the Kholm Pocket. USSR lays siege to the Kholm Pocket but the Germans hold out for a about a year and a half. Russian Front - South: Day 68 of 122 of the Battle of the Lower Dnieper River, USSR. MTO - Italy: US 12th Air Force B-24s bomb at Genoa and Sampierdarena while B-17s hit Savona, Varazze, Porto Maurizio, and Imperia. B-25s and fighters support the ground troops. CBI - China: Day 2,307 of 2,987 of the 2nd Sino-Japanese War. PTO - New Guinea: Day 42 of 219 of the Battle of Shaggy Ridge. PTO - New Guinea: Day 39 of 162 of the Battle of the Huon Peninsula. ETO - Germany: The gas chambers at Auschwitz are used for the last time. ETO - France: Day 91 of 284 of the Battle of Brittany. ETO - Belgium: Day 59 of 62 of the liberation of Belgium. ETO - Belgium: Day 29 of 38 of the Battle of the Scheldt Estuary. ETO - France: Day 46 of 236 of the Siege of Dunkirk. ETO - Germany: Day 42 of 145 of the Battle of Hürtgen Forest. ETO - Germany: US 8th Air Force B-17s and B-24s bomb oil refineries. Russian Front - Finland: Day 46 of 223 of the Lapland War. Finland and Russia have joined forces to kick the Germans out of Finland's most northern province. Russian Front - Center: Day 16 of 206 of the Battle of the Courland Pocket in Latvia. Germans will hold this area until the very end of the war. Russian Front - Center: Day 9 of 99 of the Siege of Memel, a border town of Lithuania and East Prussia. Russian Front - Center: Day 47 of 72 of the Battle into East Prussia and northern Poland. Russian Front - Center: Day 15 of 15 of the Battle of Goldap, East Prussia. The Soviets pull out, giving the Germans a victory. Russian Front - South: Day 2 of 108 of the Battle of Budapest, Hungary. Russian Front - South: Day 47 of 72 of the Battle of Belgrade, Yugoslavia. MTO - Austria: US 15th Air Force B-24s hit the marshalling yard at Klagenfurt. CBI - Burma: Day 213 of 302 of the Chinese Salween Offensive in Burma. CBI - China: Day 2,673 of 2,987 of the 2nd Sino-Japanese War. Day 197 of 259 of Japan's Operation ICHI-GO. PTO - New Guinea: Day 321 of 597 of the Battle of New Britain. PTO - New Guinea: Day 192 of 481 of the Battle of Western New Guinea. PTO - Palau Islands: Day 46 of 74 of the Battle of Peleliu (Operation STALEMATE II). PTO - Philippines: Day 11 of 299 of the 2nd Battle of the Philippines, aka the Liberation of the Philippines or the Philippines Campaign. PTO - Philippines: Day 11 of 73 of the Battle of Leyte. Ireland: Monsignor Hugh O'Flaherty, Irish Roman Catholic priest and senior official of the Roman Curia, passes away. He was responsible for saving 6,500 Allied soldiers and Jews during World War II. He was responsible for saving 6,500 Allied soldiers and Jews during the years of Fascism under Mussolini and the subsequent German occupation of Italy. In the early years of World War II, O'Flaherty toured POW camps in Italy and tried to find out about prisoners who had been reported missing in action. If he found them alive, he tried to reassure their families through Radio Vatican. When Italy changed sides in 1943, thousands of British POWs were released. However, when Germany imposed an occupation over Italy, they were in danger of recapture. Some of them, remembering visits by O'Flaherty, reached Rome and asked him for help. Others went to the Irish Embassy to the Holy See, the only English-speaking embassy to remain open in Rome during the war. O'Flaherty did not wait for permission from his superiors. He recruited the help of other priests, agents working for the Free French, and even Communists and a Swiss count. O'Flaherty and his allies concealed 4,000 escapees, mainly Allied soldiers and Jews, in flats, farms and convents. One of the first hideouts was beside the local SS headquarters. When outside the Vatican, O'Flaherty wore various disguises, which earned him the nickname "the Pimpernel of the Vatican." The German occupiers tried to stop him and eventually they found out that the leader of the network was a priest. SS attempts to assassinate him failed. They learned his identity, but could not arrest him inside the Vatican. The head of the SS and Gestapo in Rome learned of O'Flaherty's actions and ordered a white line painted on the pavement at the opening of St Peter's Square (signifying the border between Vatican City and Italy), stating that the priest would be killed if he crossed it. The head of the neo-Fascist Italian police in Rome, often spoke of his intention to torture O'Flaherty before executing him if he ever fell into his hands. When the Allies arrived in Rome in June 1944, 6,425 of the escapees were still alive. O'Flaherty demanded that German prisoners be treated properly as well. At the time of the liberation of Rome, O'Flaherty's organization was caring for 3,925 escapees and men who had succeeded in evading arrest. Of these 1,695 were British, 896 South African, 429 Russian, 425 Greek and 185 American. The remainder were from 20 different nations. This does not include Jews and sundry other men and women who were in O'Flaherty's strictly personal care. O'Flaherty regularly visited his old nemesis Colonel Herbert Kappler (the former SS chief in Rome) in prison, month after month, being Kappler's only visitor. In 1959, Kappler converted to Catholicism and was baptized by O'Flaherty. 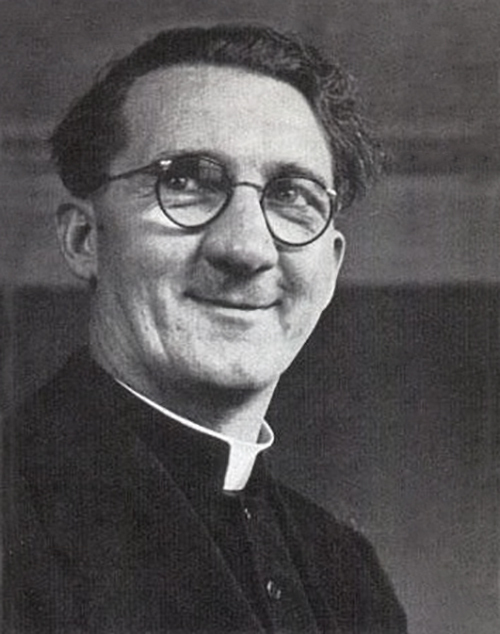 The story of Monsignor Hugh O'Flaherty, a real life Irish Catholic priest who saved thousands of Jews and Allied refugee POWs in Nazi-occupied Rome. As Hitler and the Nazis seduced a nation, bullied a continent, and attempted to exterminate the Jews of Europe, a small number of dissidents and saboteurs worked to dismantle the Third Reich from the inside. One of these was Dietrich Bonhoeffer, a humble man of faith. Over 500 personal photographs produce a unique flavor of life in and around the airbase plots of "Little America" in Norfolk.